If you have been looking for ways to clear out clutter as a way to clear out your mind I have something I want to share with you. Even if you just want to sort out your home and aren’t too preoccupied about the mental benefits and only focused on the practical ones then this post is still for you. Today I want to bring you an introduction to the KonMari method. The first project I am tackling in my simple living approach is all about decluttering. I’m have recently finished the The Life Changing Magic of Tidying Up: The Japanese Art of Decluttering and Organising audio book and I am eager to put those practices to work. 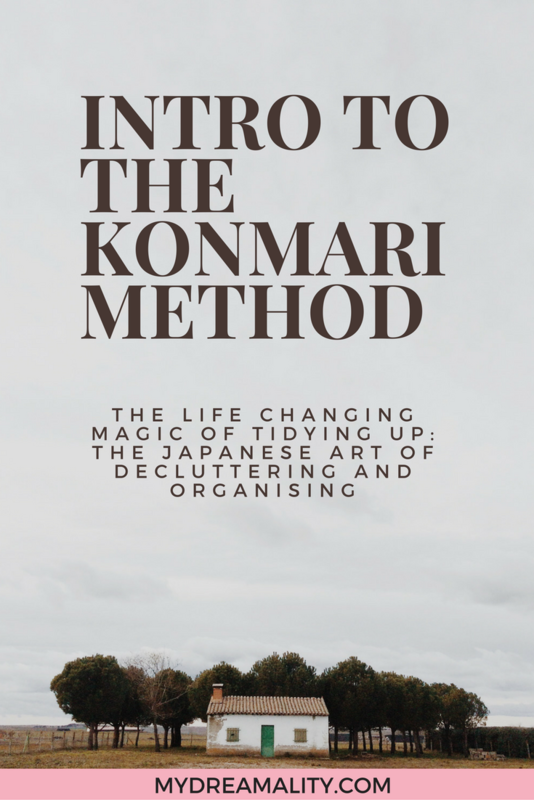 In this post I want to share with you an introduction to the KonMari method. While I do recommend reading the book I know that sometimes you won’t know if something will pique your interest or work for you until you know more. The KonMari method is a unique method of decluttering developed by Japanese organising consultant Marie Kondo. KonMari, as she is more commonly called, has created a revolutionary approach to the way we de-clutter and tidy our homes. The KonMari method is a method of organisation that emphasizes tidying up and organising the home in one fell swoop. The point of this approach is all about preventing any relapse in the state of your home. It also is meant to make tidying up a one time affair and making sure you keep your home in that state for good. Her method is unique in quite a few ways, but the primary reason her approach is so uncommon is because it entails connecting with your items before you decide if they belong in the rubbish bin or somewhere within your home. Most methods of organising and tidying up often want you to focus one doing things room by room or working on things bit by bit. While that can be said to be a better approach than not doing anything at all, those methods are flawed because you never seem to finish tidying and organising. How many times have you begun tidying up one room of your home only to find the same items are being moved and shifted throughout? It has happened to me, which is why I can’t wait to put KonMari to practice. If you tidy all at once then your house will be in order once and for all. Tidying all at once does not mean that you do it ALL in one go or that your house will be purged of clutter all in one day. The concept is to dedicate time to the tidying process, whether that be 6 weeks or 6 months. That is the only way to ensure that you don’t have to repeat the process again in a years time. Tidying usually begins by sorting out one room at a time, and as I said before, it ends up with items being passed from room to room. If those items don’t have a designated place they shouldn’t be in your home. Which is why discarding by category is the method KonMari recommends. This means sorting out all of the like things at once and in a particular order. Her way is not subtle, and it doesn’t mean opening one drawer to see what you can sort out from there. Each time that you tackle a category you have to gather everything that belongs in the category, ie all the clothes in the house. Set everything on the floor and take it from there. The only way to know what to keep is to hold each item in your hands and ask yourself if it sparks joy. It is important to give your undivided attention to the process and focus on each individual item. An item sparking joy doesn’t necessarily mean that the item makes you want to jump for joy. If the item is one that you like to wear, one you feel good in, or one that gets plenty of use then that falls into the joy category. This is not a toss and store as you go approach. Her recommendation is to discard everything that you will be getting rid of before you begin any form of organisation. If you will be discarding something you may be ridden with guilt about how the item is still useful and has life left in it. The process isn’t about whether or not the old t-shirt you wear to bed can still be used for a few more years, it’s about how it makes you feel and the place it has within your life, and ultimately your home. Getting items out of your home doesn’t mean that they go in the bin. Sure, if they need to go in the bin then that’s where they should go. The process is more about letting go and passing on the item to someone who it may spark joy in. If you want to follow along on my journey testing this method that some have called “life changing” I will be following the process and sharing it with you from start to finish.